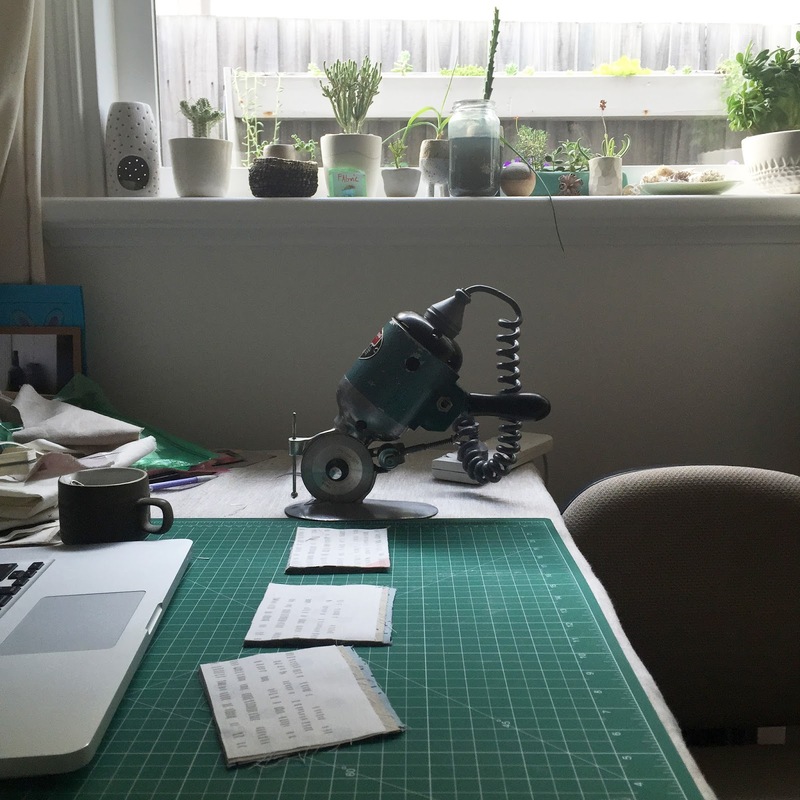 Earlier this year my husband and I had a chat about possible ways to lighten my workload - I do everything myself: sourcing, ordering, designing, printing, heat setting, cutting, photographing, packaging. I've been contemplating jobs I can outsource and the possibility of hiring someone on a casual basis but finding the right person who I can trust with taking over some of my duties and fit into my rather all-over-the-place schedule seems like a big job in itself. So we moved onto tools that could help do some jobs faster at least. I heat set all of my fabric by hand, using a regular old iron. 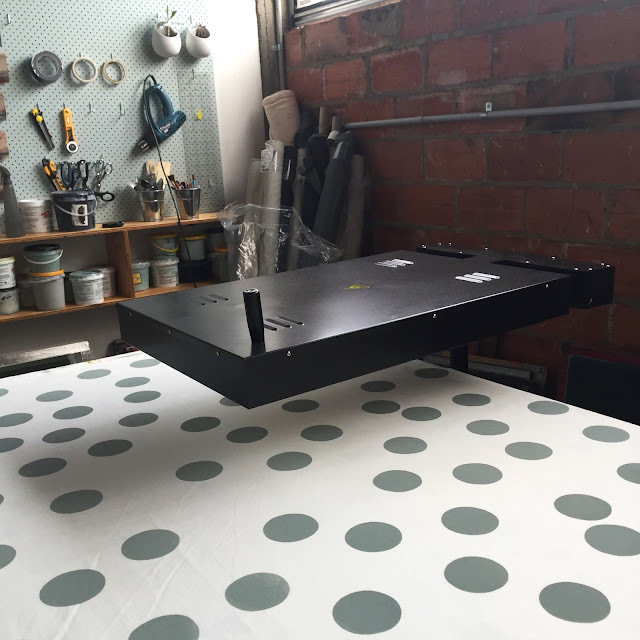 I tried an ironing press when I first started out but it wasn't wide enough for my fabric panels and I found it impossible to gauge which bits had been done sufficiently when heat setting larger pieces. I've had a few quite large orders for yardage this year and heat setting it all by hand just wasn't going to cut it (although I have done it many times in the past, it just takes soooooooo long). I started looking into heat tunnels that the professionals use (way too big and expensive, although there are some good secondhand deals around if you have the room, which I don't) and came across some flash dryers on eBay. They are basically big rectangles of radiant heat, getting up to 200˚C, that you can move over your fabric to dry the ink when printing repeats or, as I found, can heat set the water based inks in a mere 1-2 minutes flat. So I just set a little timer on my phone and move the flash dryer along while I do other stuff around the studio - yay! After heat setting everything by hand for five years, this is pretty exciting. The other new tool that has come into my life, thanks to the recommendation of my very lovely studio neighbour, Simone of Femke Textiles, is a Lightning electric fabric cutter. This baby can cut super thick piles of fabric with ease. It's a bit heavy and will take some practice to get precise lines from but I love a new gadget so am looking forward to playing with it - hopefully it will make putting Freeform Patchwork Kits together much quicker! Great to read this Leslie! These tools should be a wonderful help to increase your productivity and reduce fatigue and risks of RSI. Excellent!